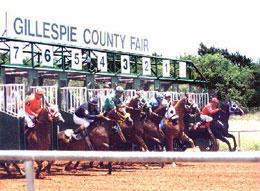 Gillespie County Fairground hosted the $20,000 Hill Country Dash, for 3-year-olds and up, on Sunday's race card. FREDRICKSBURG, TX�JULY 8, 2012�Dr. Tommy Hays and Bobby J. Barnett had barley celebrating their win with Runaway Wagon in the Firecracker Derby on Saturday night when Painted Sable won the $20,000 Hill Country Dash at the Gillespie County Fairground on Sunday afternoon. Under jockey Ricardo Aguirre, the bay filly bobbled the start but recovered to win with ease, defeating Shake Em Special Pop by one-length. She completed the 440 yards in a quick :21.682 seconds to earn a 106 speed index and pickup the winner's purse of $7,967. L.R. Jordan saddled the Pyc Paint Your Wagon filly out of Sables Dash, by Dash Thru Traffic. It the sixth win in 17 starts for the 4-year-old and pushed her career earnings mark to nearly $130,000. Lance Robinson and Max Anderson bred Painted Sable in Utah. Shake Em Special Pop rallied to clear second by one length, earning $3,390 for owner Sergio Maldonado. Abel Canales trains the Royal Shake Em gelding out of Gotta Special Pop, by Special Elan. Ignacio Bustamante was aboard the Gary Kurz bred 5-year-old with career earnings of $178,872. Eusevio Huitron saddled Huitron Homes' Streaky Baby who finished third after stumbling at the start. Carlos Castro rode the Streakin Sixes gelding. Jesus Huitron bred the 3-year-old in Texas from the Gone To The Man mare This Babys Gone. Winning Bye, Fooling The Chicks, Sixy Shazoom, Underdog On Top, First Lady Miss and Fishers Mp completed the field. La Esterilna was scratched.